As a football fan, the Military Bowl gave you just about everything you could ask for: Lots of long plays, lots of scoring, lots of momentum changes and last-minute drama. And despite the high score, there were a few great defensive moments. Here are some of the highs and lows from tonight, along with other excitement. Record denied: The guy I feel worst for tonight is Air Force’s Asher Clark. 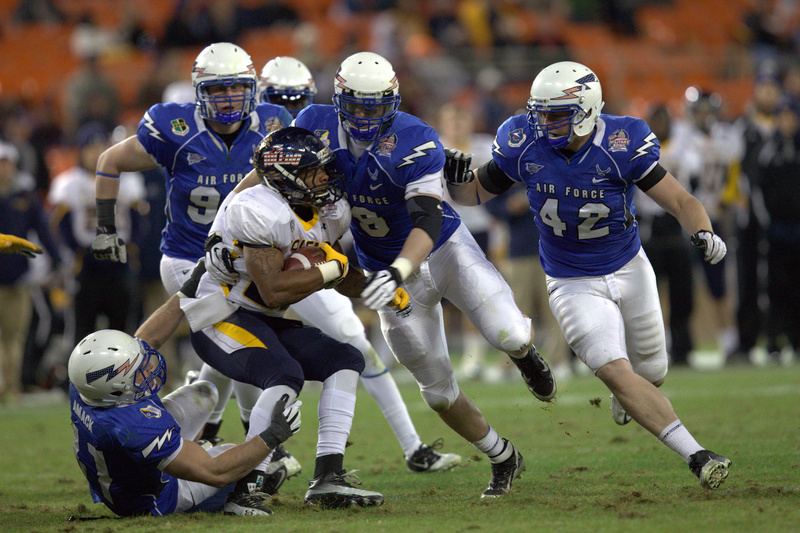 The senior running back needed only 33 yards against Toledo to become Air Force’s all-time leading rusher. But the Rockets bottled Clark up all night. He finished with only 14 yards on 12 carries. Slow starters: Air Force dug itself in a hole early and ultimately could never get all the way out. Air Force had only run three offensive plays before it was down 14-0. And as soon as Tim Jefferson got the Falcons on the scoreboard, Toledo’s Eric Page returned the ensuing kickoff for a score to make it 21-7. Air Force would rally to tie the game three times, but never led. Big play Toledo: When the Rockets scored, it was in spectacular fashion. The shortest scoring play for Toledo was their first touchdown — a 17-yard pass. The Rockets’ other TDs came on plays of 41, 87, 37 and 33 yards. Worst catch: Toledo’s Bernard Reedy watched a sure TD go through his hands on the game’s second play. The Rockets would end up coming away with no points on the drive after missing a field goal. Best catch: Air Force linebacker Austin Niklas made a fantastic shoestring catch on his third-quarter interception — the first of his career. Flyover, Fight, Win: Anytime you get a B-2 flyover before a game, Air Force wins. Doesn’t matter what the scoreboard says. Great game and excellent photos!